Aikikai Ireland - Turns the Big 4!!! 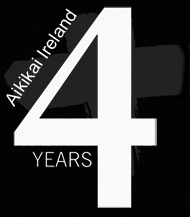 Aikikai Ireland turns the big 4!!!! It happened again we have been that busy we never got chance to mark the 4th anniversary of Aikikai Ireland. It's 4 years since the start of the group on the 2nd June 2009 which seem to have gone by in a blink of an eye. Over the past 12 months (2nd June 2012 to 2nd June 2013) there has been a lot of hard work done by the group. We have had 3 seminars with our Technical Adviser Michele Quaranta Sensei 6th Dan in Wicklow (Oct 2012), Sligo (Feb 2013) and the very first Aikikai Ireland residential summer camp in Donegal (June 2013) which was a very memorable one for all involved. Thanks to Michele Sensei for it has to be said as always fantastic seminars with a seemingly infinite amount of technical material being passed on. We had the promotion of Aikikai Ireland students from the various dojos at the grading sessions held throughout the year.A special mention to those that graded at the course with Michele in Wicklow which were 4th Dan: Eamon Coyne, Trevor Pigott 3rd Dan: Declan Bray, Tony McHugh and Valli Schafer 2nd Dan: Barry McGee, Eddie Murray, Eamonn Thompson, Norbert Toth, Barry Tully. We had an enjoyable weapons course with our friend Fiordineve Cozzi Sensei in Dublin (Jun 12) which was hosted by Heron Dojo and Fiona Kelty. Domestically we also had the Aikikai Ireland Technical Committee members Joe McHugh, Eamon Coyne and Trevor Pigott give seminars in Sligo (June and Dec 2012). Joe McHugh gave courses in Kilkenny (June and Nov 2012, April 2013) and Belfast (March and April 2013). Eamon Coyne held a cross style charity seminar with the Sligo Jiu Jitsu and Sligo Higashi Karate clubs with over €1000 going to help young Órán Nibbs. Internationally we had Trevor Pigott and Tony McHugh attend Michele Senseis summer camp in Horni Branna, Czech Republic in July 2012. We aslo had Eamon Coyne and Norbert Toth attend Michele Senseis summer camp in Slovakia in August 2012. In November 2012 Trevor Pigott, Tony McHugh, Will Baker and Gary Byrne attended the co-hosted seminar of Michele and Fiordineve inLauria, Italy.